AS the result of this battle--showing as it did the power of the ram and the ironclad--revolutionized the navies of the world, a detailed account of it will be given in the words of the author, himself an eye-witness and participant, as published in "Recollections of a Naval Officer:"
"About the 6th of March, 1862, the Merrimac [Merrimack] being ready to go out, the Norfolk papers published an article to the effect that she was a failure, and would not be able to accomplish anything. It was intended, of course, to deceive the enemy, who we knew regularly received our papers. The United States squadron then in Hampton Roads consisted of the following vessels, viz. : The Congress and Cumberland, lying off Newport News, and the Minnesota, Roanoke and St. Lawrence, at anchor below Old Point. There were also below Old Point the store-ship Brandywine, the steamers Mt. Vernon and Cambridge, and a number of transports and tugs. These, however, took no part in the subsequent engagement. 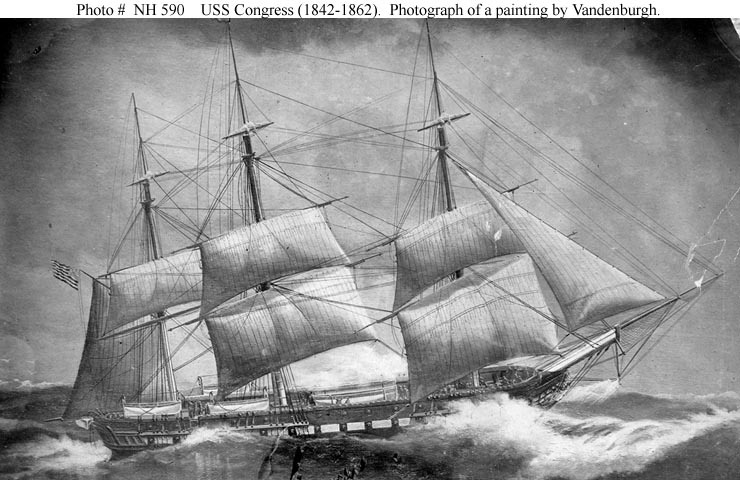 The Congress was a sail frigate of 1,867 tons, old measurement, mounting 50 guns, principally 32-pounders, with a crew of 434 men; the Cumberland was a large corvette (a razee) of 1,700 tons, old measurement, mounting 22 9-inch Dahlgren guns, with a crew of 376 men; the Minnesota was a large steam frigate of 3,200 tons, old measurement, mounting 43 guns, 9-inch and 11-inch Dahlgrens, with a crew of about 600 men. The Roanoke was similar to the Minnesota, and the St. Lawrence to the Congress. "Newport News is on the left bank of the James river, six and one-half miles above Old Point, and twelve miles from Norfolk. The enemy had a large number of guns mounted there to protect the mouth of the river, with a large garrison. At Sewell's point, three and one-half miles from Old Point, the Confederates had a powerful battery to protect the entrance to the Elizabeth river, which also in a measure commanded the approach to Newport News; but the main ship channel is at a distance of two or two and one-half miles from it. At Sewell's point was mounted the only 11-inch gun we had in the Confederate States. "Everything being ready, it was determined by Commodore Buchanan to make the attack on the 8th day of March. The last signal inserted in our signal books was, 'Sink before you surrender!" "At 11 a.m., March 8, 1862, the signal was made to sail, and the Beaufort cast off from the navy yard wharf, in company with the Merrimac and Raleigh, and stood down the harbor. The weather was fair, the wind light, and the tide half-flood; the moon was nine days old. 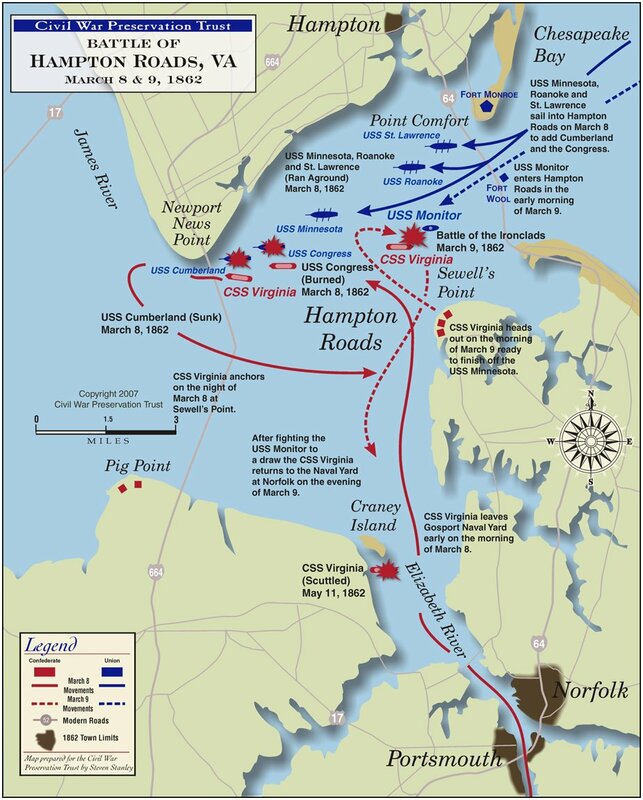 "Nearly every man, woman and child in the two cities of Norfolk and Portsmouth were at the same time on their way to Sewell's point, Craney island, and other points where they could see the great naval combat which they knew was at last to take place. Some went by land, others by water. All the batteries were manned; all work was suspended in public and private yards, and those who were forced to remain behind were offering up prayers for our success. A great stillness came over the land. "Flag-Officer Forrest, who commanded the navy yard, accompanied by many of his officers, went down with us in the tugboat Harmony as far as Craney island, four and one-half miles below Norfolk. Everything that would float, from the army tugboat to the oysterman's skiff, was on its way to the same point, loaded to the water's edge with spectators. As we steamed down the harbor, we were saluted by the waving of caps and handkerchiefs; but no voice broke the silence of the scene. All hearts were too full for utterance; an attempt at cheering would have ended in tears, for all realized the fact that here was to be tried the great experiment of the ram and ironclad in naval warfare. There were many who thought that as soon as the Merrimac rammed a vessel, she would sink with all hands enclosed in an iron-plated coffin. The least moved of all were those who were about to do battle for the 'cause' they believed in. On board the Merrimac the officers and men were coolly employed in the multifarious duties that devolved upon them, while the men of the Beaufort and Raleigh were going into battle with the same insouciance they had exhibited in the battles of Roanoke Island and Elizabeth City. "The James river squadron, consisting of the Patrick Henry, Jamestown and Teaser, under the command of Capt. John R. Tucker, had been previously notified by Commodore Buchanan that the Merrimac would go out on the 8th, and Tucker was directed to come down the river as close to Newport News as he deemed prudent, so as to be ready to dash by the batteries and join our division when the battle commenced. The commodore could not have given the order to a better man. Eager to engage the enemy, Tucker, the most chivalric and bravest of men--ably seconded by his gallant captains, Barney, Webb and Rochelle--was only too ready to fly the Confederate flag in Hampton Roads. At daylight on the 8th he was at anchor off Smithfield point, some ten miles above Newport News, and in full view of the enemy, as afterward reported by Lieut. George U. Morris, who in the absence of Captain Radford fought the Cumberland. "As we got down toward the mouth of the Elizabeth river, about 12:30 p.m., the Beaufort took a line from the port bow of the Merrimac to assist her in steering. Being very near the bottom she steered badly. We turned up the James river. The Congress and Cumberland were lying off Newport News, and were riding to the last of the flood tide. They had their boats at the booms, and 'washed clothes' up; evidently not expecting anything unusual to happen. In fact, Captain Radford, of the Cumberland, was at this time attending a court-martial on board the frigate Roanoke. The Cumberland could not have been better defended than she was by her executive officer, Lieut. George U. Morris. The Congress was lying immediately off Newport News point, and the Cumberland was a few cable lengths higher up. As soon as our vessels turned up the James river, they saw that our attack would be upon them, and they got ready for it. "At 1:30 p.m. we cast off the line from the Merrimac, and all three vessels steamed for the enemy. The Beaufort maintained her position on the port bow of the Merrimac, and exactly at 2 p.m. she fired the first gun of the day, at the same time hoisting the battleflag she had used at Roanoke island. The Merrimac now hoisted the signal 'close action,' and from that time she made no signal, nor did she answer one, until the close of the action. As we approached the enemy, firing and receiving their fire, the Merrimac passed the Congress and made for the Cumberland, which vessel was either just turning to the ebb tide, or had her broadside sprung across the channel." The action commenced about 3 p.m. by our firing the bow gun at the Cumberland, less than a mile distant. A powerful fire was immediately concentrated upon us from all the batteries afloat and ashore. The frigates Minnesota, Roanoke and St. Lawrence, with other vessels, were seen coming from Old Point. We fired at the Congress on passing, but continued to head directly for the Cumberland, which vessel we had determined to run into, and in less than fifteen minutes from the firing of the first gun. we rammed her just forward of the starboard forechains. The noise of the crashing timbers was distinctly heard above the din of battle. There was no sign of the hole above water, but it must have been large, as the ship soon commenced to careen. The shock to us on striking was slight. We immediately backed the engines. The blow was not repeated. We here lost the "prow," and had the stem slightly twisted. The Cumberland fought her guns gallantly as long as they were above water, and she went down bravely with her colors flying. One of her shells struck the side of the bow port and exploded, the fragments killing two and wounding a number. One aft 9-inch gun was loaded and ready for firing, when its muzzle was struck by a shell which broke it off, and fired the gun. Another gun also had its muzzle shot off and was broken so short that at each subsequent discharge its port was set on fire. The damage to the armor was slight. The fire appeared to have been aimed at our ports. Had it been concentrated on the water-line we would have been seriously hurt, if not sunk. Owing to the ebb-tide and our great draft we could not close with the Congress without first going up stream, which was a tedious operation, besides subjecting us twice to the full fire of the batteries [at Newport News], some of which we silenced. We were accompanied from the yard by the gunboats Beaufort, Lieut. Comdg. William H. Parker, and Raleigh, Lieut. Comdg. J. W. Alexander. As soon as the firing was heard up James river, the Patrick Henry, Commander John K. Tucker; Jamestown, Lieut. Comdg. J. N. Barney, and the gunboat Teaser, Lieut. Comdg. W. A. Webb, under command of Capt. John R. Tucker, stood down the river, joining us about 4 o'clock. All these vessels were gallantly fought and handled, and rendered valuable and effective service. The prisoners from the Congress stated that when on board that ship it was seen that we were standing up the river, that three cheers were given under impression we had quit the fight. They were soon undeceived. "The Beaufort and Raleigh engaged the Congress and shore batteries, and the firing was fast and furious. We took up a position on the port quarter of the Congress, and used the rifled gun with effect. The Merrimac rammed the Cumberland, striking her just forward of the starboard fore-channels---firing and receiving a heavy fire in return--and stove her bow in so completely that she at once commenced to go down. As she took the bottom, she turned over on her beam ends. She made a gallant defense, her crew fighting the guns to the last, and went down with her colors flying. This was at 2:40 p.m. precisely. Boats went off from Newport News to save the drowning men. "The Merrimac reversed her engines immediately upon ramming the Cumberland, and had some difficulty in extricating herself--indeed her bow sunk several feet. When free, she proceeded a short distance up the river to turn round; having clone which she stood for the Congress. As soon as the Congress observed the fate of her consort she slipped her cable, set the fore-topsail flying, and with the assistance of a tug ran on shore below Newport News. At this time I observed the James river squadron coming gallantly into action. They were under a very heavy fire while passing Newport News, but got by without receiving much damage. All of our vessels now directed their fire upon the Congress. The Beaufort took position on her starboard quarter, and kept it until she surrendered. The fire on this unfortunate ship was terrible. She returned it with alacrity, principally from her stern guns, and was assisted by the batteries on shore. "We saw now the frigates Minnesota, Roanoke and St. Lawrence coming up from Old Point to the assistance of the Congress, towed by powerful tugs. They were under a heavy fire from the batteries on Sewell's point in passing, and received some damage. The Minnesota received a rifle-shot through her mainmast, 'crippling it,' according to her captain's report. Strange to say, all three of these vessels ran aground--the Minnesota about one and a half mile below Newport News, the Roanoke and St. Lawrence farther down. The Minnesota was near enough to take part in the engagement, and the St. Lawrence fired a few broadsides. The Roanoke and the St. Lawrence were soon pulled off by the tugs, and made the best of their way back to Old Point. They took no further part in the action. The Minnesota remained aground. "The Congress made a gallant defense, and did not surrender until one hour and twenty minutes after the ramming of the Cumberland. Her decks were running with blood, and she bore the brunt of the day. At 4 o'clock she hoisted a large white flag at her main truck. . . . When I saw the white flag, I immediately lowered a boat, and sent Midshipmen Mallory and Foreman to take possession of the prize. My aide, Midshipman Ivy Foreman, hauled down the Congress' flag and brought it to me. "The firing having ceased, the Merrimac signaled me to 'come within hail,' which I did. Commodore Buchanan then ordered me to 'go alongside the Congress, to take the officers and wounded men prisoners, to permit the others to escape, and to burn the ship.' I went alongside her in the Beaufort, and sent an officer to direct her commander to come to me, at the same time sending my men aboard to help get the wounded men to the Beaufort I did not think it proper to leave my vessel myself, as I had but two young and inexperienced midshipmen with me, and I saw an enemy's gunboat not very far off. In a few minutes Lieut. Austin Pendergrast came down the side of the Congress, accompanied by an officer whom I took to be the surgeon or paymaster of the ship. This officer proved to be Capt. William Smith, who had been in command until a few days before, when he had been relieved by Lieut. Joseph Smith. Lieutenant Smith had been killed, which left Pendergrast in command. Captain Smith was a volunteer, as I afterward learned. "These two officers surrendered the ship to me and delivered up their arms. I told Pendergrast my orders, and requested him to get his officers and wounded men on board the Beaufort as quickly as possible. He said there were 60 wounded men on board the frigate, and begged me not to burn her. I told him my orders were peremptory. While we were engaged in this conversation the wounded men were being lowered into the Beaufort, and just then the Raleigh came alongside me. I sent her to the starboard side of the Congress to help in the work. I had scarcely given the order when a tremendous fire was opened on us from the shore. Medical Director Shippen, U. S. N., says it was from the Twentieth Indiana regiment. The fire was from artillery as well as small-arms. At the first discharge every man on the deck of the Beaufort, save Captain Smith and Lieutenant Pendergrast, was either killed or wounded. Lieutenant Pendergrast begged me to hoist the white flag, saying that all his wounded men would be killed. I called his attention to the white flag which was flying at his mast-head, directly over our heads. "The lieutenant then requested permission to go on board the Congress with Captain Smith to assist in getting the wounded down. This I assented to. In the first place, I was glad to have their assistance; and secondly, I was not willing to confine them in my cabin at a time when the bullets were going through it like hail; humanity forbade it. I would not have put a dog there. I now blew the steam whistle, and my men came tumbling on board. The fire still continuing, we cast off from the Congress and opened fire on the shore. The sides and masts of the Beaufort resembled the top of a pepper-box, from the bullets which went in one side of her, and out at the other. Being much encumbered with the prisoners I ran alongside the tugboat Harmony, and delivered them to Commodore Forrest. We then steamed immediately back, and joined the other vessels in the attack on the Minnesota, which vessel was still aground. "Between 7 and 8 p.m. we hauled off in obedience to signal, and anchored between Sewell's point and Craney island. At midnight the Congress blew up. According to the report of Lieutenant Pendergrast she had been on fire from the beginning of the action; and Medical Director Shippen, who from his station would be likely to know, says: 'We were on fire in the sick-bay, in the main hold, and under the wardroom near the after magazine. Some of these fires were extinguished; but the most dangerous one, that near the after magazine, was never extinguished, and was the cause of the explosion which during the following night blew the ship to pieces." "The results of this day's operations were the total destruction of the frigate Congress and the corvette Cumberland, and the partial crippling of the steam frigate Minnesota. The loss in killed and drowned on board the Cumberland, as reported by her commander, was 121; and the surgeon reported 14 wounded, which makes 135 casualties. I find it difficult to ascertain from Lieutenant Pendergrast's report how many men the Congress lost in all. He gives the total number of killed and missing as 136 .... There is reason to fear that some wounded men were left on board to be consumed by the flames, who would have been taken off by the Beaufort and Raleigh, under the flag of truce, had they not been fired on by the troops on shore. The fire of these troops killed their own wounded men as they were being lowered over the side, and rendered it impossible for us to continue the work. The Minnesota lost 3 killed and 16 wounded, and there were some casualties reported among the other vessels. The loss in the Federal fleet in killed, drowned, wounded and missing must have amounted to nearly 400 men. "On our side, the Merrimac lost 21 killed and wounded, the Patrick Henry 14, the Beaufort 8, the Raleigh had Lieutenant Tayloe and Midshipman Hutter killed--how many men I do not know, nor have I any information as to the number of killed and wounded on the Teaser. The Jamestown had no casualties, though she was in the thickest of the fight. Our total loss, however, did not exceed 60. On the Merrimac, Commodore Buchanan and Lieut. R. D. Minor were wounded. Captains Webb, of the Teaser, and Alexander, of the Raleigh, were slightly wounded. Lieut. Catesby Jones succeeded to the command of the Merrimac." 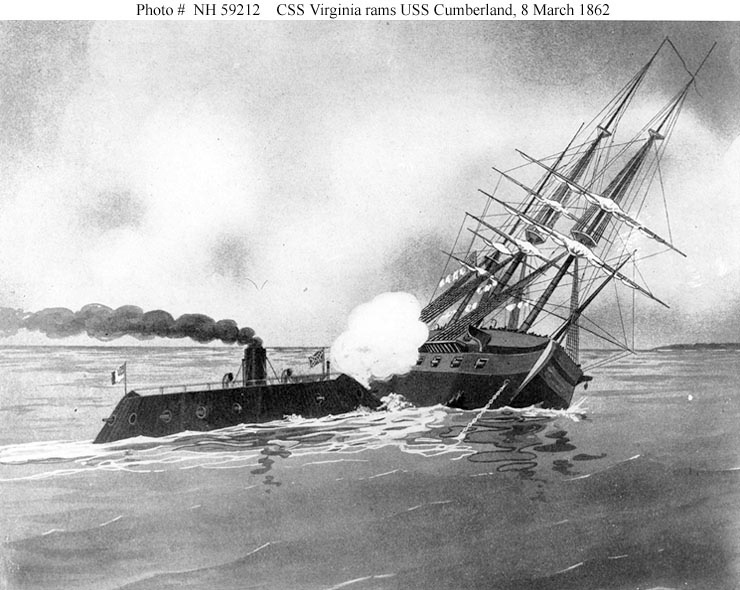 Having thus destroyed the Cumberland, the Merrimac turned again upon the Congress, which had in the meantime been engaged with the smaller rebel steamers [the Beaufort and Raleigh], and after a heavy loss, in order to guard against such a fate as had befallen the Cumberland, had been run aground. The Merrimac now selected a raking position astern of the Congress, while one of the smaller steamers [the Beaufort] poured in a constant fire on her starboard quarter. Two other steamers of the enemy also approached from James river, firing upon the unfortunate frigate with precision and severe effect. Lieutenant Pendergrast, of the Congress, says: "The smaller vessels [the Beaufort and Raleigh] then attacked us, killing and wounding many of our crew." The captain of the Minnesota, Van Brunt, also speaks of the damage done his vessel by the wooden Confederate steamers Patrick Henry and Jamestown. It is useless to deny the important services of our wooden gunboats on this occasion; and although it is possible that the Merrimac alone could have accomplished all that was done, certain it is that if these gunboats had been sent in on the next day, March 9th, with the signal for "close action," the Minnesota would have been destroyed beyond a doubt. On the night of the 8th, the Confederate squadron remained at anchor off Sewell's point. Commodore Buchanan and his flag lieutenant, Robert Minor, were removed to the hospital on shore. The remainder of the wounded received the attention of Surgs. Dinwiddie Phillips, John Mason, Randolph Mason and Algernon Garnett. These gentlemen had belonged to the medical corps of the old navy, a corps of educated, courteous gentlemen which can, perhaps, be equaled, but never excelled. "About 11 p.m.," as Commander Jones narrates, "one of the pilots [of the Merrimac] chanced to be looking in the direction of the Congress, when there passed a strange looking craft which he at once proclaimed to be the Ericsson [Monitor]. We were therefore not surprised to see the Monitor next morning at anchor near the Minnesota." ERICSSON'S Monitor, as described by Professor Soley, "consisted of a small iron hull, upon which rested a large raft, surmounted by a revolving turret. The hull was 124 feet long and 34 feet wide. The raft projected at the bow and stern, its total length being 50 feet greater than that of the hull. Its overhang amidship was 3 feet 8 inches wide, gradually increasing toward the bow and stern. The raft was 5 feet deep, and was protected by a side armor of five 1-inch iron plates backed with oak. The deck was covered with two -inch plates, over timber laid on heavy wooden beams. The turret was armored with eight 1-inch plates, and its roof was protected by railroad iron; in it were two 11-inch Dahlgren guns. The pilot house, in front of the turret, was built of square iron bars, notched together, with a bolt through the corners. On the top of the pilot house was an iron plate, 1 inch thick, set in a ledge without fastenings." When the victors of March 8th retired that night, they hoped to accomplish a great work on the following day. The Minnesota was aground, the Roanoke and St. Lawrence had retired below Old Point, and the enemy was known to be greatly demoralized. How much, was not realized. No mortal man could have surmised what was afterward learned, but the Confederate naval officers intended to destroy the Minnesota, and then see what could be done with the other vessels. The Monitor had been heard of, but only in rumor. Shortly after 8 a.m. on the 9th, the squadron got under weigh, and the Merrimac proceeded toward the Minnesota, closely attended by the Patrick Henry. The Monitor now made her appearance. James Barron Hope said she looked like a "cheese-box." She engaged the Merrimac for some time, the wooden vessels looking on. It was a naval duel, though the Merrimac occasionally fired at the Minnesota, and received her shot in return. It appeared to be a battle between a giant and a pigmy, but it should be remembered that the Merrimac was very hard to manage and drew twenty-two feet water, whereas the Monitor was readily handled, and drew but ten feet. In point of fact, it was not necessary to maneuver the Monitor at all; for as her turret revolved, all she had to do was to stand still. This, indeed, is one of the strong points of this class of vessels, fighting in rivers or shallow water. They can always bring a gun to bear as long as the turret will revolve. The fight had continued three hours. To us the Monitor appeared unharmed. We were therefore surprised to see her run off into shoal water where our great draft would not permit us to follow, and where our shell could not reach her. The loss of our prow and anchor, and consumption of coal, water, etc., had lightened us so that the lower part of the forward end of the shield was awash. We for some time awaited the return of the Monitor to the roads. After consultation, it was decided that we should proceed to the navy yard, in order that the vessel might be brought down in the water and completed. The pilot said if we did not then leave, that we could not pass the bar until noon of the next day. We therefore, at 12 m., quit the roads and stood for Norfolk. Had there been any sign of the Monitor's willingness to renew the contest, we would have remained to fight her. We left her in the shoal water to which she had withdrawn, and which she did not leave until after we had crossed the bar on our way to Norfolk. Thus ended the fight between the Merrimac and Monitor. It may be added that the Merrimac's damages were slight, and in her encounter with the Monitor she had not a man killed or wounded. Commodore Josiah Tattnall now took command of the squadron, and Lieut. J. Pembroke Jones relieved Lieutenant Minor as flag lieutenant. On the 11th day of April the squadron proceeded to Hampton Roads to engage the enemy. The United States squadron at anchor below Old Point consisted of the Minnesota (flagship) and some other frigates, the Monitor, the Naugatuck (ironclad), and a large number of smaller vessels and trans. ports. In the course of the day the steamer Vanderbilt --a vessel specially designed to ram the Merrimac--arrived. The Confederate vessels took possession of the roads, cut out three vessels from under the enemy's guns, and defied the enemy to battle. The United States vessels remained ignominiously at anchor under the guns of Old Point. At sunset, finding that Flag-Officer Goldsborough would not fight, Commodore Tattnall made signal to anchor off Sewell's point. 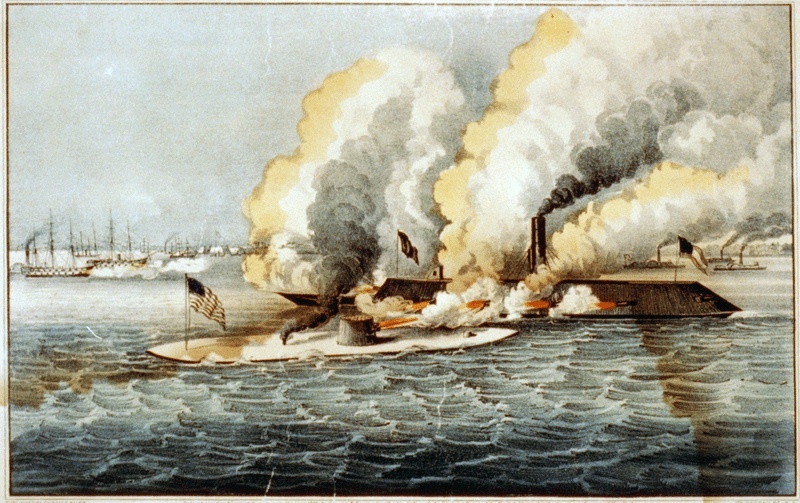 On the 8th of May, the Merrimac being at the navy yard, the United States vessels (including the Monitor) attacked the batteries at Sewell's point. Upon hearing the guns, the Merrimac proceeded to the scene of action. Upon her drawing near, the enemy incontinently fled, and took refuge under the guns of Fortress Monroe. Norfolk was evacuated by the Confederates on May 10, 1862, and on the same night the Merrimac was set on fire and blown up by her commander. The officers and crew landed on Craney island and proceeded to Drewry's bluff, some eight miles below Richmond. Flag-Officer Tattnall applied for a court-martial. It is sufficient to say he was acquitted, the opinion of the court being that "the only alternative was to abandon and burn the ship [the Merrimac] there and then." The other vessels of the squadron had been previously dispatched to Richmond. Capt. John R. Tucker, in command, hearing that the enemy's ships were ascending the river, immediately commenced preparations to defend the city. The Jamestown and some other vessels were sunk in the channel. The guns of the Patrick Henry and Jamestown were with incredible labor carried up and mounted on Drewry's bluff, and manned by the crews of those vessels. On the 15th of May the ironclads Galena, Monitor and Naugatuck, with the gunboats Port Royal and Aroostook, the whole under the command of the indomitable Commodore John Rodgers, U S. N., attacked the battery. The enemy's squadron was driven off with considerable loss, the Galena being seriously damaged. Commander Ebenezer Farrand, C. S. N., commanded the combined forces on the bluff. The officers and crew of the Merrimac had arrived two days before, and manned some of the guns. But the credit of this defense, which saved the city of Richmond, belongs fairly to Capt. John R. Tucker, Commander J. N. Barney, the officers and crews of the Patrick Henry and Jamestown, and to Major Drewry and his brave soldiers. Palmam qui meruit ferat. Lieut. John Taylor Wood, in command of a company of sharpshooters, manned the banks of the river near Chapin's bluff, and considerably annoyed the enemy, as did Capt. John D. Simms with a company of marines. The battle between the Merrimac and Monitor has been much discussed, and both sides have claimed the victory. 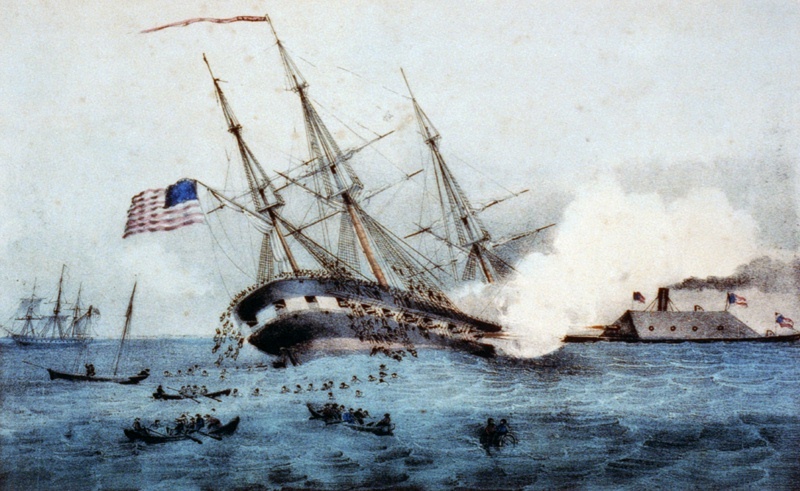 The honors of the day may be technically awarded the Monitor (in consequence of the Merrimac's leaving for Norfolk), for she remained on the field and saved the Minnesota. The Merrimac should undoubtedly have destroyed that ship before leaving the roads. It was a lost opportunity, for the Monitor when she withdrew was a whipped ship. 1. The omission of the name of Lieut. Dana Greene, who succeeded to the command of the Monitor after Captain Worden was wounded, from the official report of his captain. 2. The report of Captain Van Brunt, of the Minnesota, who distinctly says, "The Monitor stood down for Fortress Monroe." 3. The shameful letter of Ericsson to Captain Fox in relation to Greene. 4. The panic pervading the Northern cities, incited by the secretary of war, Mr. Stanton, who actually ordered the Potomac river to be obstructed fifty miles below Washington. 5. The suggestion of President Lincoln to "obstruct the Elizabeth river, to keep the Merrimac from coming out." 6. The rejection of Captain Worden's claim for prize money by the naval committee of Congress in 1883. 7. The earnest request of General McClellan that the Merrimac should be neutralized. 8. The employment of the steamer Vanderbilt to ram and destroy the Merrimac, what the Monitor had failed to do. 9. 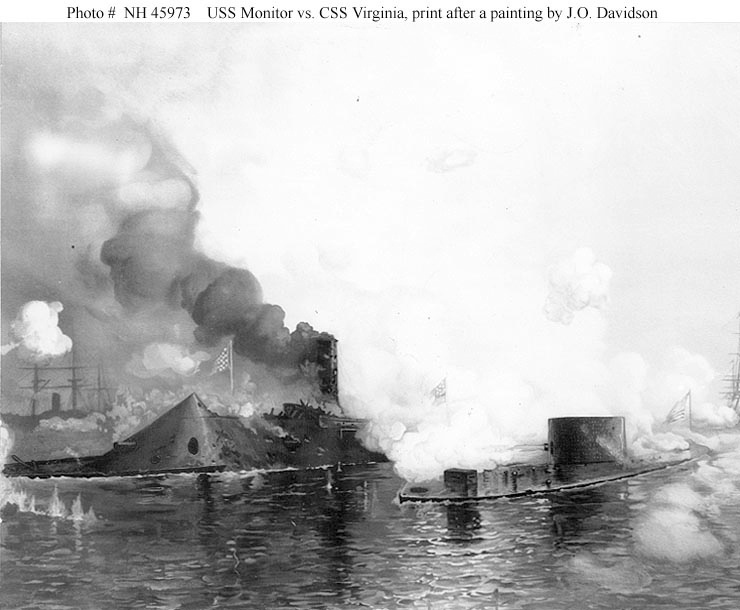 The fact that the Monitor declined to engage the Merrimac on the 11th day of April, 1862. 10. 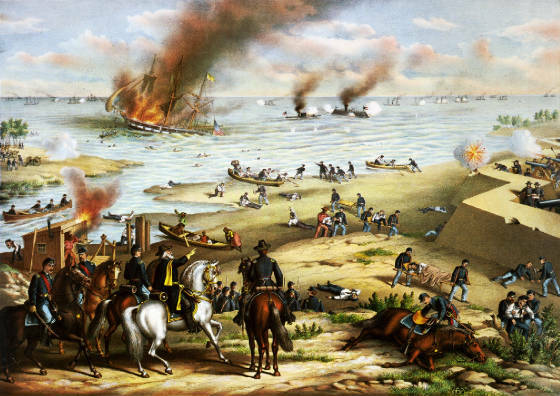 The further fact that the Monitor ran away from the Merrimac on the 8th day of May, 1862. No further proofs are required. The Monitor was a whipped ship on the 9th of March, the only day she dared encounter the Merrimac; and what is more, the defeat was generally conceded by the United States authorities at that time. The claim of a victory for the Monitor was an afterthought, and only asserted when the Merrimac had been-destroyed by her own commander. The destruction of the Merrimac by her commander on the night of May 10, 1862, came upon the Confederacy like a clap of thunder. Commodore Tatnall's intention was to lighten the ship, by throwing overboard coal and stores, to a draft of eighteen feet, and then proceed up the James river to Harrison's bar, forty miles below Richmond. After the ship had been thus lightened, the pilots suddenly declared the ship could not be taken there. The ship being now no longer an ironclad as to her hull--the lightening had brought the eaves of her shield above water, and there were no means to bring her down again to her proper draft of twenty-two feet--nothing remained but to destroy her. But what service would she have been at Harrison's bar or anywhere else, when one shell at her unprotected water-line would have sent her to the bottom as quickly as an iron pot sinks! In point of fact, when the Merrimac was left without support by the evacuation of Norfolk, there remained but one of two things to do, viz., to blow her up, or to attack the enemy's fleet below Old Point, and proceed to the York river and destroy McClellan's transports. The latter course might have resulted greatly to Confederate advantage. It is possible, now, to see some such results as these: That Flag-Officer Goldsborough's vessels would have proceeded to sea without waiting to be attacked; Fortress Monroe would have surrendered; McClellan's plan of campaign would have been frustrated, and the Chesapeake bay and the mouths of the Potomac, Rappahannock, York and James rivers would have been controlled. But Commodore Tattnell has been fully justified in the alternative course he adopted. The moral effect of the Merrimac was most wonderful. The United States authorities were panic-stricken. Many of those high in command completely "lost their heads." The dread of the Merrimac extended among the seaboard cities from Boston to Washington. Never in the history of the world has the effect of a single ship been so marvelous! As she revolutionized the navies of the world, one can understand the sensation created in Europe. But the terror inspired by the Merrimac at the North, the wild speculations as to what she could and would do, and the universal panic, must ever remain a marvel.